Have you ever woken up in the middle of the night and found yourself unable to move? It can be one of the more frightening things to happen while trying to rest, but why does sleep paralysis occur? The first time you experience it you might think something was very wrong, but it’s actually more common than you would expect, and doesn’t necessarily indicate any wider problems. In this article we will look at the causes of sleep paralysis, and some methods that can help reduce its occurrence. Why Do You Get Sleep Paralysis? How Do You Prevent Sleep Paralysis? Is Sleep Paralysis a Disorder? As the name would suggest, sleep paralysis is when you find yourself temporarily unable to either move or speak while you are falling asleep or waking up. You may experience difficulty breathing and be able to open your eyes, but control over the rest of your body is lost. It can be worrying because you are conscious throughout. Most people will experience this a few times in their lives, but others can find it a more frequent occurrence. It’s actually more likely to happen to teenagers or young adults, but can affect people of any age. There are various different stages of sleep, all that involve a large amount of activity in the brain. As your body is dormant during rest, full control is relinquished to focus on other processes. Normally this doesn’t matter because you are completely unaware of it, but sometimes you can transition to some phases without having fully fallen asleep, and this is when sleep paralysis happens. It occurs, in particular, when entering rapid eye movement sleep while still being awake. The cause of this is not fully understood, but there are some factors that can increase the likeliness of it happening. These include not sleeping enough, not having a regular sleep pattern because of working in shifts or having jet lag, having sleep conditions such as narcolepsy, having a history in your family of sleep paralysis, or something as simple as sleeping while lying on your back. Feeling paralyzed during sleep can be a scary experience, so it luckily doesn’t happen very often to most people. There’s no need to worry if you do experience it and there are things you can do to help reduce the chances of it happening. Sleep paralysis can occur as a result of a number of factors, mainly because of how they interrupt the natural progression of your sleep state. 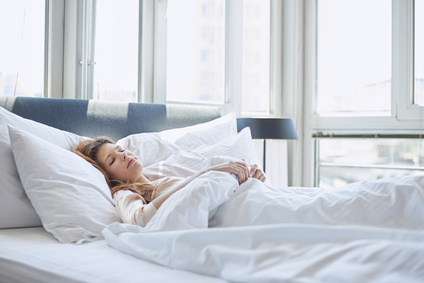 If you don’t get enough sleep, for example, when you lie down your body may transition to REM sleep quicker than normal to take advantage of the time. If this happens before you have fully drifted off then you may feel the sensation of paralysis for a few moments. Make sure you get enough sleep. Most of us need between six and eight hours of undisturbed sleep every night. Failure to do so will leave you feeling tired and susceptible to problems when you do finally manage to get some rest. ​A regular sleep routine will help your body to know when to expect its rest and will help you sleep much better. Ideally this would mean going to bed and getting up at the same time each day. ​Exercise is really important for health, and your sleep health is no different. Try not to work out within four hours of going to bed, but regular exercise can help to regulate your sleeping rhythms. ​Do not eat, smoke, or drink alcohol or caffeine before bed, as your body will start to digest these and it will interfere with sleeping. The surroundings you sleep in should be comfortable, quiet, dark, and a nice temperature. ​The simple answer to this is NO, sleep paralysis is not a disorder. It can happen in conjunction with sleep disorders like narcolepsy, but is normally an indication that you are not sleeping enough or are sleeping in the wrong environment. There’s no need to worry if you are experiencing the symptoms, but if it is happening frequently and causing distress, your doctor will be able to provide assistance. Sleep paralysis can be a scary experience, but it is only a temporary effect that will soon pass. It is not something to be concerned about, but can be an indication that you aren’t getting enough sleep and can usually be resolved by changing your behavior. Why does sleep paralysis occur? While it’s not fully understood, there are plenty of steps you can take to reduce its occurrence and, if things show no sign of improvement, doctors are able to prescribe medication that should stop it altogether.